Most of the readers must be aware of the Chinese monk, XuenZang (602-664AD), who had travelled to India in the seventh century AD. His travels extended over a period of 17 long years, and the efforts and hard work done by him in India, to make authentic copies of Buddhist Sutras'or scriptures are well known. His travelogue has been the only source, to find and learn facts about medieval India since last 1400 years and remains so even today. 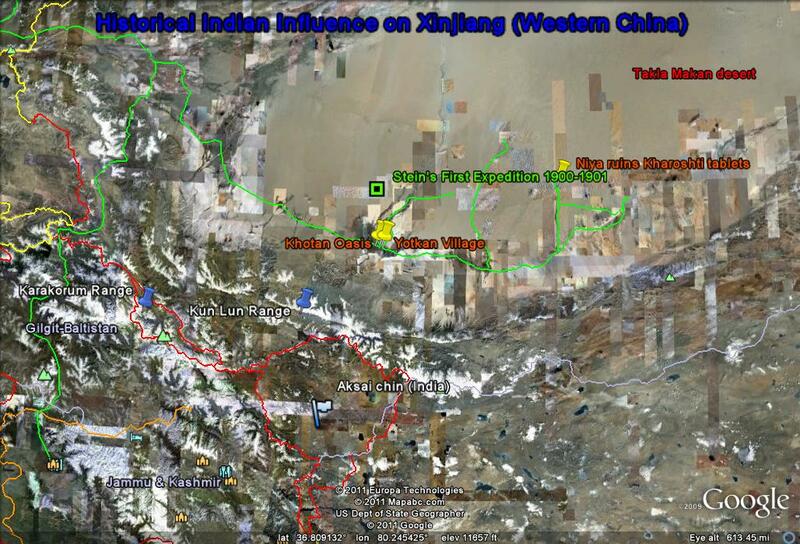 XuenZang travelled to India by a land route and returned back also by land, though by slightly differing route. His travelogues therefore are considered as an invaluable asset for Indians studying medieval history of India. Takla Makan is a huge desert area, in the Chinese western province of Xinjiang. Two Silk route branches were in use, in Xuen Zang's times, along the north and the south perimeters of this desert. There were many rich and thriving commercial centers and towns in existence, along both Silk route branches on the north and south of the desert. Most of these commercial centers were located in many desert Oases that existed along the trade route. XuenZang had naturally visited many of these Oases and had described them at great length in his travelogues for the information of future generations. In the south-west of Takla Makan desert, a larger oasis known as Hotan, exists even today. This place was famous in XuenZang's times, for Jade and gold dust mines and was an important trading center on the southern Silk route. Xuen Zang has written at great lengths about history, geography and political situation in Hotan. He has also made a significant claim in his description, that Hotan and the surrounding regions, were ruled in the past by a king of Indian origin. The last battle for control of Hotan, took place between a general of the emperor of western China, Wu-Ti and the army of this Hotan king of Indian origin, in which, the Hotan king was defeated. After this battle, the people of Chinese and Indian origins, started living in separate settlements in Hotan. XuenZang gives reference of a Tibetan manuscript known as ' Annals of Li-Yul' for his claim. Since this reference is no longer traceable, authenticity of XuenZang's claims, and questions such as, who was this king of Indian origin? and Which emperor of India sent his army of Indians to Hotan? have remained largely unanswered. The famous archeologist of the twentieth century, Sir Aurel Stein came across this claim made by XuenZang and thought of launching an expedition to prove or disprove this claim. Aurel Stein originally was a citizen of Hungary; born in Budapest. During his university days, he read about Alexander's campaigns in Persia and India. He became absolutely fascinated with this history. He gave up his university career and took up a job with the British Indian Government to look for avenues to carry out research about Alexander's campaigns. During his service in India, he became an expert in arts and sculptures of the ancient country of 'Gandhar' and came up with a hypothesis that the 'Gandhar' art style must have spread to central Asia and along Tarim river basin in Chinese Turkmenistan (Xinjiang) province of China. He also found out substantial information about the silk route and eventually wished to go on an archeological expedition along the ancient silk route. He also decided to examine truth behind the claim of XuenZang, mentioned above. Sir Aurel Stein writes about this in his book. 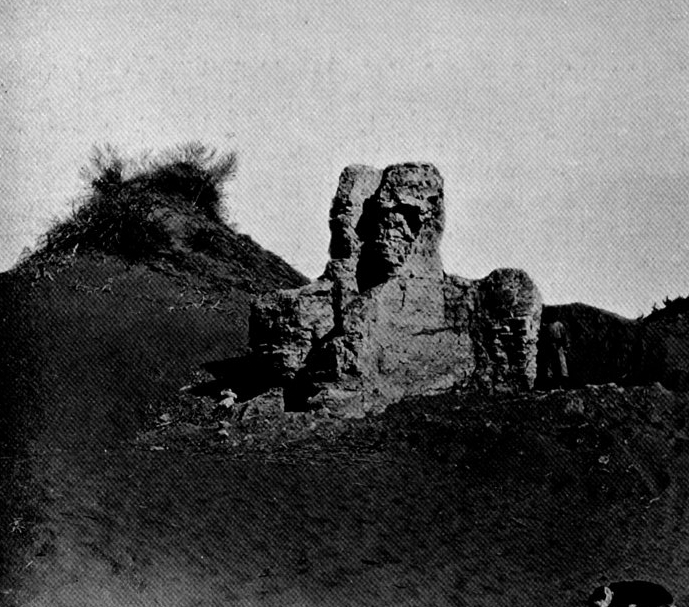 Aurel Stein launched three major extended period expeditions in the years, 1900-1901, 1906–1908 and 1913-1916, along the silk route in Chinese Turkmenistan region, all of which were sponsored by the then Government of India. Stein visited Hotan in all the three expeditions, searching for Archeological finds. He began his first expedition on 29th May 1900 from Srinagar in Kashmir and crossed the Karakoram mountains through Mintaka pass travelling through Gilgit and Hunza and leaving behind the Indian peninsula. In Xinjiang, he first stayed at Kashgar and then at Yarkund. By end of the year 1900, he reached Hotan. In the vicinity of Hotan oasis he was able to find number of Terracotta items used in second or third century CE. While excavating some promising areas on the bank of Keria river, east of Hotan, he came to know that there is an another Oasis, named as Nia on the east or river Keria. River Nia flows near about this Oasis. If he could travel towards north along with this Nia river, he would first come across a Mazar of saint Imam Jafar Sadiq. 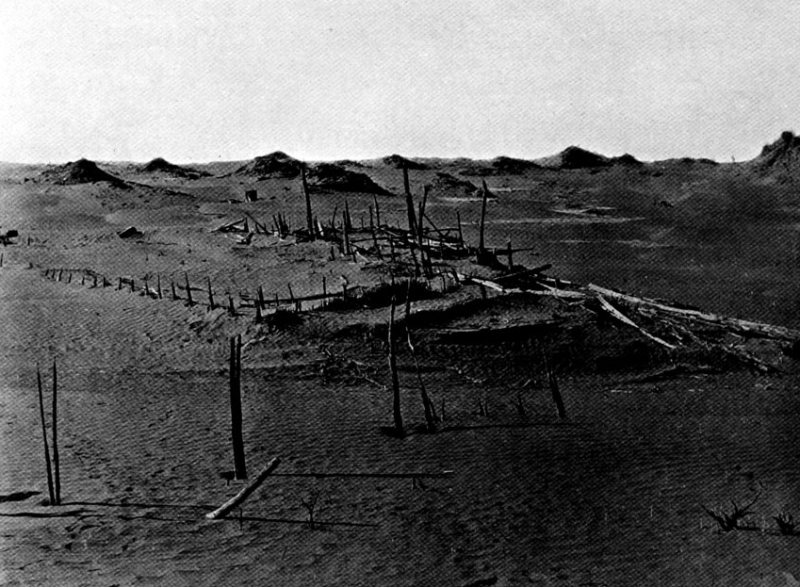 If he continues further north along the river, which is half dead, he would come across an ancient settlement now almost submerged in the desert sands. Aurel Stein felt after hearing the description that this was the kind of place, which can reveal old archeological treasures. He prepared well for an expedition to Nia and left on 18 January 1901 for Nia. After a torturous travel lasting for 4 days, he finally reached the Nia Oasis. During his travel, the only thing which he saw were the snow capped peaks of the Kun-Lun range of mountains on the south and sand dunes of Nia in the North. Aurel Stein writes about the joy he felt after reaching the Nia oasis. On 23rd January 1901, Aurel Stein left Nia for Imam Jafar Sadiq Mazar with twenty labourers and a small convoy of additional hired camels to help in the transport of a month's supplies. This route was of 3 days duration along the river Nia, which becomes dead after Imam Jafar Sadiq Mazar. 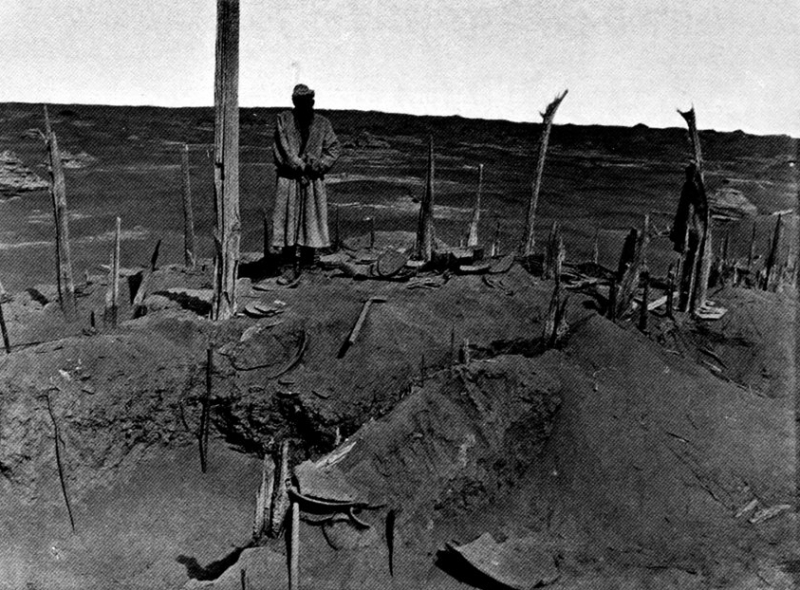 Stein, after reaching the Mazar, realized that he had reached the last outpost of human existence or civilization and to the north was a vast desert almost borderless. 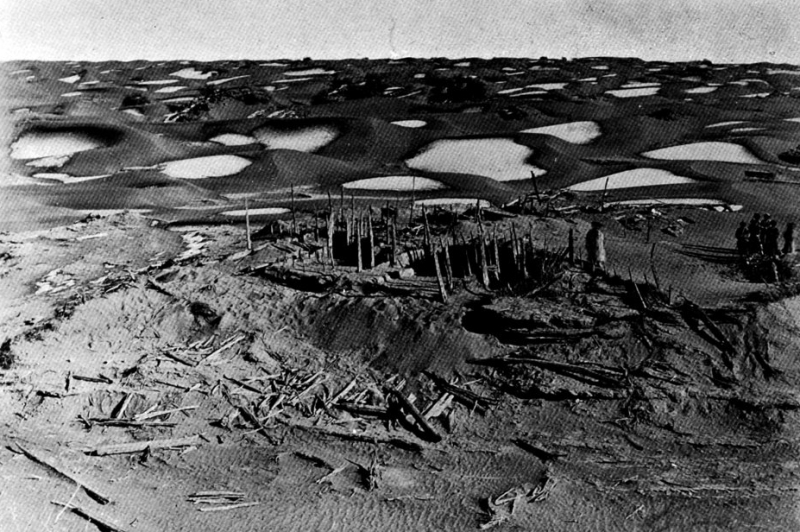 After walking along the dead river for about 2 miles, Stein could see 2 dwellings halfway submerged in sand hills. When he approached them, he could see that that they were actually ruins of a Buddhist Stupa. Since it was late evening, Stein decided to camp in the vicinity of ruins only. On the next morning, with temperature hovering around zero degree Fahrenheit, Stein and his team started examining the ruins. He first reached a ruin, which was about a mile from his camp. It appeared like a terrace or a plateau above a sand hillock. After climbing up there, Stein found 3 wooden slates with some writings on them lying in a corner. Stein had studied earlier, ancient Indian scripts and immediately recognized the script in which the writing on the slates was made. The script was the “Kharoshti' script in use in ancient north India. Encouraged and recharged by this find, Stein's team began excavations around. In a spot, where there was a heap of broken wooden pillars, beams, cross members and wooden planks, Stein discovered few more slates. After this the entire terrace was excavated and the blown sand was removed. Stein found another 110 slates. Stein visited this place in both of his subsequent expeditions and in all, discovered between 200 to 300 wooden slates. and decipher few of the slates. He immediately realized that he has hit upon an invaluable historic treasure. The wooden slates, which he had found were in different shapes, sizes and styles. There were single plank slates and a large number consisted of two planks stacked together. Some were shaped like a knife blade. Double plank slates were attached to each other by a string passed through holes at one end of both slates and then tied together with a knot. In some of the double slates, notches were cut on the outer (where there were no writings) surface. A string was wrapped around both slates in the notches and then the slates were sealed with an earthen seal. The writing was from right to left (for a reader from left to right) and was written parallel to the longer side of the slate. In almost all slates, the script used was 'Kharoshti' script in use in ancient north India.